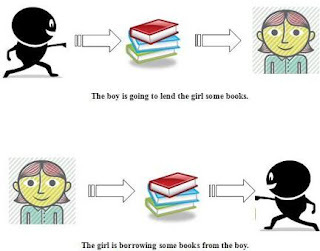 "Please, borrow me your pen" and "I borrowed him my pen" are common expressions in this part of the world where English is being taught and learnt as a second language. The incorrectness of these expressions is hidden under the ignorance of their users. Are you surprised? Do you want to know why these expressions are wrong? This article explains that. Although they chiefly function as verbs, Borrow and lend are not clad with the same semantic attire. While the latter indicates an action of giving out, the former simply means to receive. In other words, to lend means "to give out your belonging to another person for him or her to use, on a condition that it will be returned" while to borrow means "to receive something from somebody temporarily, expecting to return it." Therefore, it is very wrong to say, for example, "Please, borrow me your pen" or "He borrowed me his pen." Rather, we can say, "Can I borrow your pen?" or "He lent me his pen" respectively.